Alliance Search Solutions is proud to announce that they’ve won Inavero’s Best of Staffing® Client and Talent Awards for providing superior service to their clients and job candidates. Less than 2% of all staffing firms in the U.S. have earned the Best of Staffing Award for service excellence. 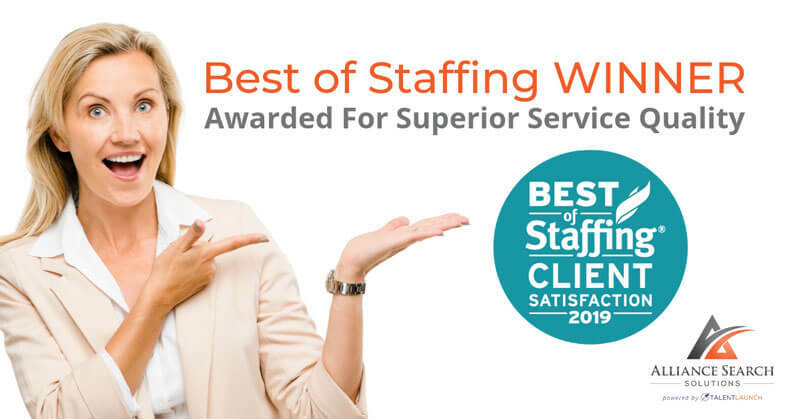 The Best of Staffing awards are a direct reflection of Alliance Search Solution’s mission: to consistently match top performing companies to great talent through a positive, seamless recruitment experience. When you succeed, we succeed. When clients rate a company in the network a 9 or 10 out of 10, we know that we are providing top-notch experiences and creating a positive impact on their businesses. Alliance Search Solution’s scores, 85.7 on the client side and 84.6 on the talent side, are significantly higher than the staffing industry benchmarks – 9 and 21, respectively. Alliance Search Solutions uses these scores to strive to improve each year. The written feedback received from the surveys are used to create initiatives throughout the year to better serve clients and talent and continuously improve our services. These awards are more than a trophy in a case. They represent the values that Alliance employees live every day; including fostering meaningful relationships, driving results by making it happen, achieving great outcomes quickly and using accountability to establish transparency and openness with our clients and talent.